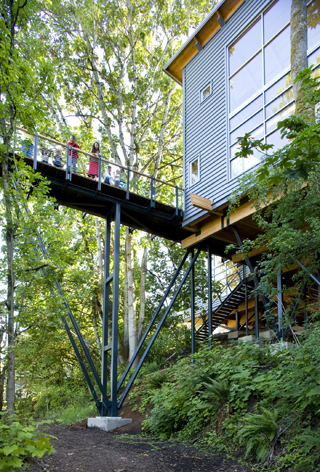 Environmental Education Center is one serious tree house where guests come face to face with nature. Classrooms and meeting spaces bring visitors to the center into close contact with the natural environment. Like nature, architecture can speak softly. 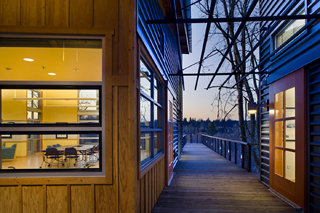 The Mercer Slough Environmental Education Center actually blends in with the woods, very close to Interstate 405 in Bellevue. Exiting on Southeast Eighth Street, there's no hint of it until you head south on 118th Avenue Southeast. A few steps from the street, and you are in the trees. Up in them, that is. A system of boardwalks leads out to two viewpoints, with several warmly modern classrooms and gathering spaces standing in between. When you reach the doors, the ground has already dropped away and the forest floor is far below. This is a serious tree house, a campus in the canopy, where you can study the environment while face to face with the pileated woodpecker, Steller's jay and northern flicker. “See that tree,” said architect Johnpaul Jones, pointing to a large trunk rising through opening in the boardwalk. “It's about the space between the buildings, and what it does to you when you are in the place.” The constellation of structures brings subtle drama to the scene, but it's really about the trees. The facility — with classrooms, a community room and visitor's center and laboratories — is open year round for school programs and visitors. It connects with a complex of long and short walking and bicycle trails, some with interpretive information about the ecosystems of the site. 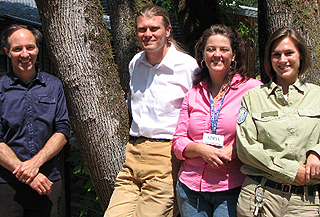 Apryl Brinkley is site manager for Pacific Science Center, which partners with the city of Bellevue to bring educational programs to the environmental education center. And when they do, it's so intimately connected to the environment that it feels like it's been here forever, she added. 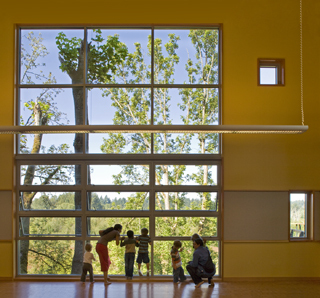 Designed by Jones & Jones Architects and Landscape Architects for the city of Bellevue and the Pacific Science Center, Mercer Slough Environmental Education Center is becoming discovered as a place to observe and study freshwater ecosystems, wetland ecology, and the effects of urban development. Mercer Slough is large swath of green space north of Interstate 90 and lined up on the west side of I-405. In deep history, it was a marshy finger of Lake Washington and parts of it were dredged for water transportation, but it slimmed down in 1916 to a trickle with the construction of the ship canal and the lowering of the lake levels. Windows open the interior of the center on to the slough. Much of it was an agricultural landscape through the rest of the century, until the construction of Bellefield Office Park, whose extensive paved parking began to impinge on the open space. It was around that time, in the late 1970s, when the citizens of Bellevue began to seek ways to preserve the natural landscape. When more office park development threatened in the early 1980s, the community was galvanized in support of the wetlands, and the environmental movement lent more urgency behind preserving the site and creating a visitors' and education center. Over the years, Mercer Slough became part of a much larger vision for preserving watersheds in the city. Noting that Bellevue has not had flooding problems in the last decade, city Parks & Community Services Director Patrick Foran said the protected wetlands of Mercer Slough are a huge practical and economic asset, not only for the city but for the region, slowing and cleaning water as it heads into Lake Washington. The Environmental Education Center now leverages that asset to nurture new generations of environmental stewards. Beginning in the late 1970s, Jones & Jones guided a city planning effort for the entire preserve, including trails and building sites for facilities that would serve a growing program for education and environmental stewardship. As team members studied the options for construction, one of the top priorities was to have as little impact as possible on the living landscape. They began with a site near the opposite side of the slough near Bellevue Way, where architect Johnpaul Jones imagined the visitor's view might slice down through the “muck” that shows how wetland species live together. But a planned roadway expansion and other constraints forced the team to consider the present site on the eastern edge of the slough. The boardwalk leads around trees and between buildings. Corrugated siding and lap-seam roofing, with limited wood siding, keep the buildings light and durable. Finding the site for the center was an exciting time, according to Foran. While it seemed inhospitable to building, it also offered a unique perspective — looking out over the slough, but also immediately adjacent to the wetland itself. Foran and Jones found themselves among the giant evergreens that had populated the edge of the water when the lake levels were high. From there, they peered out over the whole basin, with the Bellevue skyline beyond. While they wanted to get close to the view, they also wanted to preserve as many of the older trees has possible. Then another complication emerged. The soils were very soft under the clay surface, with a lot of water filtering through glacial till and historic slide areas. It's one thing to be light on the land, but this land simply wouldn't hold up under much. “You have to ask,” said architect Mark Johnson, “what is the carrying capacity of the site?” The answer: About half of what they had ideally wanted. The program “went on a diet,” with different purposes scheduled to share the same space. Then the design team went to work mapping the trees. The idea was to get the building walls as closely enmeshed with the forest as possible, without sacrificing healthy specimens. At the same time, the team explored ways to lift floors off the ground, perching buildings and walkways high above minimal footings. This kept building impacts small at the ground level. “A conventional footing would not work,” said Johnson. In the final design, buildings rest on four-foot square footings atop underground pilings, and these footings represent only about 35 percent of the total floor area. The forest floor ecosystem flows almost uninterrupted beneath the facility. Based on a system of boardwalks among elevated buildings, they settled on a plan in which the walkways would lead out through the buildings in two directions. One leads nearly parallel to the slope, ending with a breathtaking view out over the slough toward a skyline framed in trees. Another leads back close to the hillside, so that it never emerges from the trees but instead ends in a close communion with the canopy. According to Jones, the idea was to keep the building structures thin and light. Their simple shed forms, along with light wood and corrugated metal materials, keep the buildings “light on the land” in form as well as impact. Most of the buildings rest on elevated floors, with lap-seam metal roofs. The design team calls these “aerial buildings.” But not all of the buildings are perched up high. There are also “terrestrial buildings,” such as labs and rest rooms, built into the hillside with conventional foundations and green roofs. Although one of these, a wet lab building, will be built in a later phase of the project, the foundation is already poured so that the ground will not have to be disturbed again. As in other environmental education facilities designed by Jones & Jones, the complex is stretched out and separated so that visitors are obliged to revisit the outdoors often, and in the most pleasant way. Classrooms and administrative structures are separated by boardwalks, for instance, and rest rooms have their own small buildings. Despite his involvement throughout the projects, Foran was “stunned” with the way that the center meets the high expectations set for its interactions with the site. At the center of the complex, the boardwalk passes among a series of angled gabion walls (steel cages filled with loose rocks), topping just above the walking surface and aligned at odd angles like a natural logjam. In addition to gathering and slowing the water, gabions and gutters disperse it deep into the slope and send it out in different directions. The center demonstrates sustainable construction in both technical and esthetic terms. The underside, with its carefully detailed floor beams high above, along with its posts and bracing, brings a little drama to the peaceful setting. With LEED gold certification pending, the project is thoroughly green in its design and materials as well as its mission. As the city takes the first steps toward setting green standards for its capital projects, the center sets a precedent and an example. Many of its sustainable features are easily transferable to other projects, like the porous concrete that percolates water, the radiant floor heating and the dual-flush toilets. “There are so many things that we do now that we take for granted,” said Ken Kreager, project manager for the Bellevue parks department. And some are particularly appropriate to the facility, like the green roofs on the lab buildings and the minimal-footprint foundations. But planning — and restraint — are the most important of all. “The scale is one of the greenest things about it,” said Kreager. With many more people discovering the center and surrounding trail network for recreation, exercise and even bicycle commuting, he is not worried about protecting it. The Project of the Month is sponsored by the Daily Journal of Commerce and the Seattle chapter of the American Institute of Architects. The project for June was selected with the assistance of architect Leslie Bain, arts director Cath Brunner (4Culture) and architect Don Brubeck. For information about submitting projects, contact Stephanie Pure at AIA Seattle at (206) 448-4938, or stephaniep@aiaseattle.org.